Welcome to the VSRDA web site! Welcome to the internet information site for the Virginia Search and Rescue Dog Association (VSRDA). Please enjoy browsing our site to learn more about the volunteer services we provide. Please contact us to see if we have an opening for K-9 Handlers and Support Personnel/Base Operations. We have limited space as we pair applicants with mentors. To apply to VSRDA in, please read the Become a Member page. The Virginia Search and Rescue Dog Association (VSRDA) is the Southeast's oldest air scenting wilderness search dog unit. VSRDA is available 24 hours a day, 7 days a week at no charge to the requesting agency. VSRDA is a member of the American Rescue Dog Association (ARDA) the National Association for Search and Rescue (NASAR), and the Commonwealth of Virginia Search and Rescue Council (VASARCO). 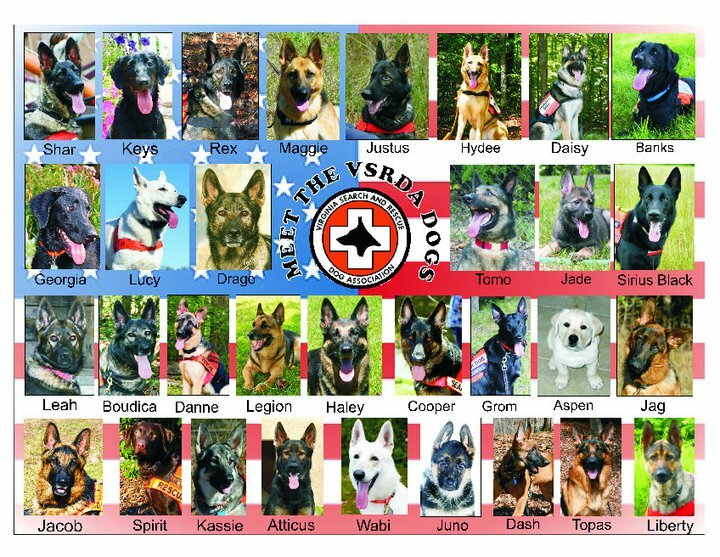 Meet the Dogs of VSRDA! Please note: We can only respond to requests for our services from applicable local, state and/or federal responsible agencies. Missing Pets - we do not search for missing pets. If your pet is missing, you can find help HERE.